Collect five to make a crown. The Shining Leaf is an item found in HeartGold and SoulSilver. It is a very rare item that can be found by the player's Pokémon when walking around. When it is found by a Pokémon, it will have no apparent presence other than in that Pokémon's status screen. 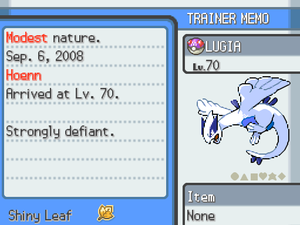 When a Shining Leaf is shown to the player's friend Lyra or Ethan, she/he will explain about them and request for the player to bring four more. When the player shows her/him a single Pokémon with five Shining Leaves attached to it, she/he will then award the player with star for his or her Trainer card, and then craft the leaves into a Leaf Crown. A Pokémon can find a Shining Leaf while being in the grassy area of a route, but the specific route a certain Pokémon can find one depends solely on its nature. However, because of its rarity, a Pokémon is not guaranteed to find a Shining Leaf, even when the route and nature match. Therefore, the player should check their Pokémon frequently to make sure a Leaf can be found in that area. Whenever a Shining Leaf is found, upon examination, the Pokémon will have an exclamation mark above its head, do a dance swaying from right to left, then finish off with a green musical note above its head. Following is a list of all the Shining Leaves found in the games, with sections for each family, as well as the routes where they are found. This page was last edited on 30 October 2010, at 01:46.